I have sold out of both NESRGB board and cables. Thank you everybody for your orders. It will take me a little while to get on top of everything so please be patient. I will also organise for more to be made but cannot give a date at this time. I developed a board that can be installed inside a NES or Famicom to improve the video quality. This is not a replacement PPU (Picture Processing Unit, the NES graphics chip) nor does require any parts from Nintendo arcade hardware. The NESRGB board effectively bypasses parts of the PPU - Palette RAM (Color Generator), Decoder, and DAC. These functions are duplicated in the NESRGB board with a focus on video quality. The timing of the video is unchanged so there is no lag (no framebuffer, no VGA, no HDMI, etc, etc), just non-interlaced 15kHz video output. Drakon has created video captures from the board (Youtube links). 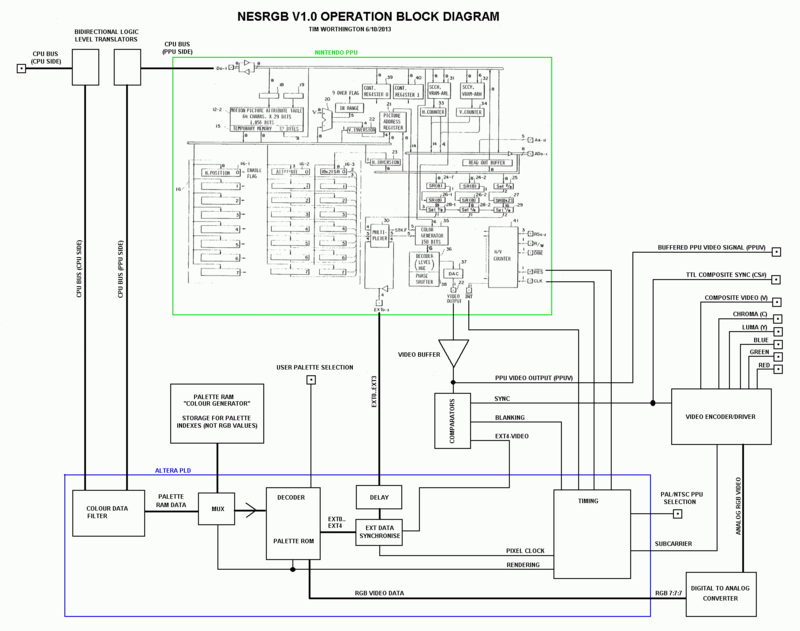 Refer to the operation block diagram. The PPU part of the diagram is taken from US patent number 4824106. An Altera PLD sits between the PPU and the CPU data bus. When the CPU writes data into the Palette Ram (Color Generator) the data is captured and stored in the NESRGB board. Modified data is passed to the PPU. The PLD also intercepts writes to the register controlling the operation of the Multiplexer, making EXT0-3 outputs. The modified data passed to the PPU removes data already available at the EXT0-3 outputs. The rest of the information required (EXT4, blanking, and sync) is extracted from the video output with comparators. The video data is then decoded from the palette currently selected and passed out to the DAC and video encoder. User selectable palette. Three palettes available, I call them Natural, Improved, and Garish. The Natural palette has the same colours as the normal composite video output. It comes from the Nintendulator NES emulator. Improved is from the FCEUX emulator. There is more variety in the colours. Some games look significantly better with this one. Garish is also from the Nintendulator but it is a palette from the Nintendo Playchoice PPU. It's very colourful indeed. More of a curiosity than anything else. There is a fourth choice - if no palette is selected the NESRGB board will 'turn off' and just pass data through. This way the NES will output composite video as if the board was not installed at all. Built in audio and video amplifier. Useful for the Famicom which does not have A/V outputs already. Outputs RGB, S-video (encoded from RGB), composite video (encoded from RGB), and composite video (original from PPU). Compatible with PAL and NTSC consoles (jumper selectable). Supplied with audio/video connectors, four position switch, and other assorted bits that may be required for installation. 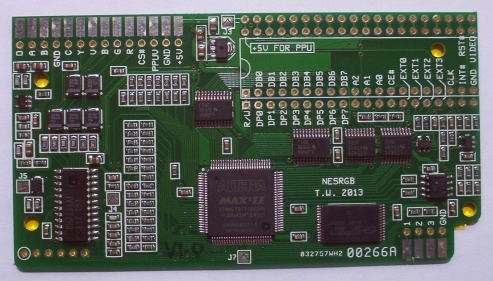 The NESRGB board is designed with the NES front loader in mind. It sits in a socket where the PPU normally lives. The PPU is mounted in the NESRGB board. 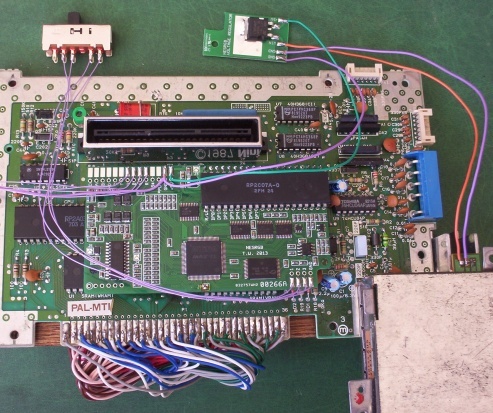 See the picture below as an example (ignore the jumble of wires soldered to the card edge finger at the bottom of the NES motherboard, it is not related to the installation). It also shows a separate voltage regulator board which is recommended for the NES because the NES's own voltage regulator heat sink is small and may get too hot with the additional load from the NESRGB board. Pin adapter PCBs will be eventually be available for top loader NES and A/V Famicom units. The price is be AU$90 for a NESRGB board + kit of assorted parts. Sorry to disrupt this opening post, but Drakon's modding practices keep coming up in this thread. Please do not derail the discussion of this product. If you want to talk about Drakon, this thread is not the place. Please discuss here. Last edited by viletim on Tue Oct 22, 2013 11:04 am, edited 3 times in total. That looks fantastic. When the AV Fami version and scart cables are available I will be having one of these. Would the first run of PCBs theoretically fit a Sharp Twin Famicom? Nice work! Does the board work on 50Hz PAL NES units as well as 60Hz NTSC units ? $85 USD is incredibly reasonable and I cannot wait to order one. Excellent work! Last edited by philexile on Mon Oct 07, 2013 3:19 pm, edited 1 time in total. I doubt it, due to where the PPU sits on the Twin Fami board. You can wire up a 40-pin socket on a separate breadboard and have the kit hooked up to that. I don't think that any kind of analogue interference (and hence jailbars) should be a problem. The signal seems to get completely regenerated by the FPGA and should be as clean as it gets. A possible weak point might be the usage of the original sync/video signal, but I'm sure we'll see more demos quite soon. Great been waiting for this. I understand that is uses RGB, S-Video, Composite and Composite video but are these connections on the NESRGB board that you solder to and then u make your own cable up be it RGB Scart plug or BNC cables etc?? About time someone starts supplying the huge and unmet demand for NES RGB chips! Make a missile snap a bone gristle. Last edited by hermit crab on Mon Oct 07, 2013 10:25 pm, edited 1 time in total. How is the relative RGB image quality vs. a "standard" RGB implementation using a Playchoice PPU? From the PCB picture it looks like you have the output 220uF capacitors in reverse? Or is the stripe positive on those types? Can't wait to install one! What are the chances you or someone else will be selling pre-modded systems? Depending upon the resulting quality of the video output I intend to install these kits in a batch of toasters. I have an AV Famicom and please take my money. It would need to be wired into place, I suppose. Yes! It works on the PAL and NTSC NES equally well. I'm from a PAL country and wouldn't have it any other way. There is no visible interference/noise in the video signal. You can if you like. I will supply a female 8 pin mini din socket (same as XRGB-MINI) and 3.5mm audio jack socket with the board. I recommend using them as they are easy to mount and I will be supplying SCART cables to suit this configuation. One question... My NTSC NES has horrible interference. Wavey lines, like some kind of sine waves running down the screen. Barely visible (but there) with dark colors and infuriatingly impossible to ignore with light colors (blues/greys in particular). I think you should fix your NES first... Maybe the filter capacitor before the voltage regulator has gone bad? The image quality is excellent. I don't own a Playchoice PPU to compare. Looks great! Have you tested this on a XRGB? From the PCB picture it looks like you have the output 220uF capacitors in reverse? Or is the stripe positive on those types? They are tantalum capacitors. The mark is on the positive side. I will not, but surely somebody will. Also great to hear the same chip will work for both PAL and NTSC consoles, if I understood correctly. Very flexible for someone running an installing service, or just someone like me that's not sure which console to mod. I got it to fit in my twin famicom with a homemade ppu socket relocation. With the twin if I added even a small distance between the socket and the kit I would get glitching so an almost point blank range relocated socket is how I got it to fit. I wired up the socket on the underside of the twin pcb and suspended the kit upside down because of the extra space found underneath. Drakon, I'm guessing you've seen the picture quality of this vs. your Playchoice 10 PPU mod. What's better from an RGB perspective? I much prefer this kit and I'm very happy it's been made. This kit outputs interference free video because it's a digital source. Having the composite pallette and working colour emphasis bits is a dream come true. It works in a famicom. 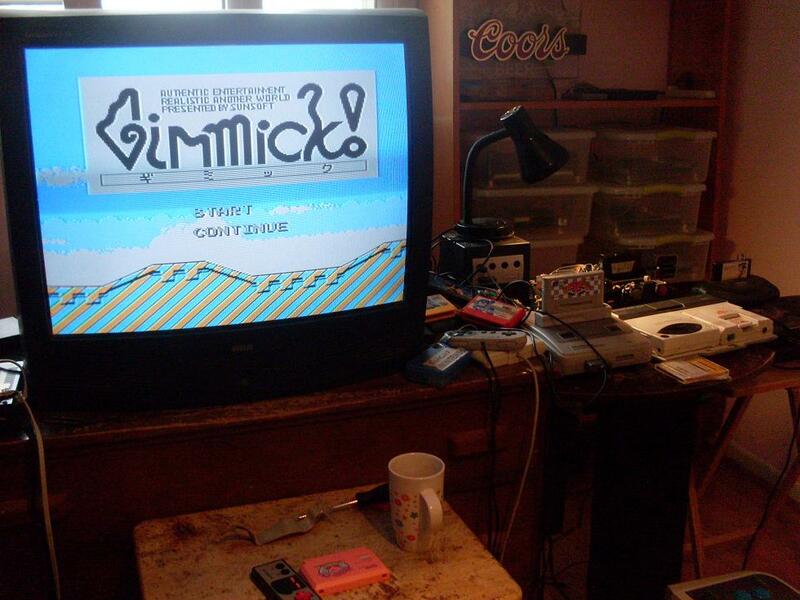 So far I've got it running just fine in a nes 2, av famicom, 1989 gpm-02 orginal famicom, and my sharp twin famicom. I like my top loaders. I also want to say a big thank you to Tim for not only making this amazing product but also for being a really friendly person who let me help in the little ways that I could. Tim: you should post this over at nesdev if you haven't already. Drakon: you're really in Toronto? Nes collecting is a small market here, I'm surprised I never bumped into on other local forums (ever visited cgcc.ca?). I run nesreproductions.com and live in downtown Toronto. What a small world. Tim, you are a genius and a blessing to the Retrogaming community. Awesome work! I'm going to get one for my AV Famicom.